This article is about Learning And Teaching (or Teaching and Learning) B.Ed. first year notes. 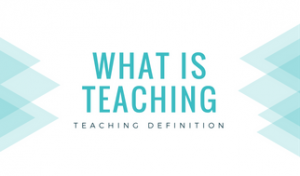 It explains 'What is teaching' , Teaching definition and what is teaching in education . Not only this you will gain an insight on concept of teaching in education. Sample Question:- What is teaching (Teaching definition)? Differentiate it with other relative concepts like instructions, conditioning, training, and indoctrination. Teaching is one of the instruments of education and is a special function is to impart understanding and skill. The main function of teaching is to make learning effective. The learning process would get completed as a result of teaching. So, teaching and learning are very closely related. Now let us discuss about concept of teaching and teaching definitions as stated by some prominent philosophers and educationists.. Teaching is a process in which one individual teaches or instruct another individual. Teaching is considered as the act of imparting instructions to the learners in the classroom situation. It is watching systematically. Dewey:- considers it as a manipulation of the situation, where the learner will acquire skills and insight with his own initiation. (1) H C Morrison:- Teaching is an intimate contact between the more mature personality and a less mature one. (2) Jackson:- Teaching is a face to face encounters between two or more persons, one of whom ( teacher) intends to effect certain changes in the other participants ( students). (3) J B Hough and James K Duncan:- Teaching is an activity with four phases, a curriculum planning phase, an instructing phase, and an evaluating phase. This definition presents organizational aspect by which we can describe and analyze the teaching process. (4) N.L.Gage ( Democratic point of view ):- Teaching is interpersonal influence aimed at changing the behavior potential of another person. (5) Clerk:- Teaching refers to activities that are designed and performed to produce in students behavior. We can define teaching according to following three viewpoints. This teaching does not develop thoughts and attitude in the students. This teaching is teachers centric criticism of the teachers. Teaching is done at understanding level. Such teaching is known as thoughtful teaching. According to this point of view, teaching is an interactive process, primarily involving classroom talks which takes place between teachers and student. Here students can ask questions and criticize the teachers. Here students can ask the questions and self-disciplined is insisted. It is known as reflective level teaching. It is more difficult then memory level and understanding level of teaching. Memory level and understanding level teaching are must for the reflective level of teaching. It is highly thoughtful activity. In this level both students and teachers are participants. Teaching is undertaken for the society and by the society. With everchanging social ideas, it is not possible to describe exact and permanent nature of teaching. Teaching tells students about the things they have to know and students cannot find out themselves. Communication of knowledge is an essential part of teaching. Teaching is an interactive process between the student and the teaching sources, which is essential for the guidance, progress, and development of students. (4) Teaching is a process of development and learning. (5) Teaching causes a change in behavior. (6) Teaching is art as well as science. (7) Teaching is face to face encounter. (8) Teaching is observable, measurable and modifiable. (9) Teaching is skilled occupation:- Every successful teacher is expected to know the general methods of teaching-learning situations. (11) Teaching is both conscious and an unconscious process. (12) Teaching is from memory level to reflective level. (13) Teaching is a continuum of training, conditioning, instruction, and indoctrination. Teaching aims at the development of potential and intellect. Reinforcement is not necessary for teaching. In teaching repetition of the taught subject matter is not necessary. In teaching qualitative and quantitative techniques are used for evaluation. Teaching is a broader process with various levels. It aims at modification of behavior and learning habits. Reinforcement plays a vital role here. Conditioning is done by the repetition of behavior to be acquired. Evaluation in conditioning is done on the basis of the acquisition of a behavior or a habit. Conditioning is considered as the lowest level of the entire process of teaching. Teaching continues for a long time. Teaching is the broader area. Training helps already knowledgeable people to learn tools and techniques to apply them. Training is for few days or a few months. Training is for specific areas. Training refers to workshops, seminars, role-plays, simulations etc. Training is a specific programme of skill development. It is a planned and systematic sequence of instruction under a competent trainer. It is a time-bound process. Instruction is the act of telling the learner what to do or what not do. Teaching is imparted in school, library, political group etc. Indoctrination is the process of forming certain beliefs. Some ideas are infused in the mind of the learner from the beginning. These ideas are continuously put in the minds of the learners and thus such ideas become their firm believes. Aims at the development of the potential of the learner. It provides freedom to the child to learn. It aims at changing some belief and attitudes. There is no freedom to the child.